Law Web: Whether executant of deed is liable to pay enhanced stamp duty if rates of stamp duty are enhanced? Whether executant of deed is liable to pay enhanced stamp duty if rates of stamp duty are enhanced? The discussion made above would clearly reveal that, the document is not executed by the court concerned. In the meanwhile, Finance Act was introduced and the stamp duty was enhanced by 2%, which thus means petitioner is liable to pay the stamp duty as per the enhanced rate. 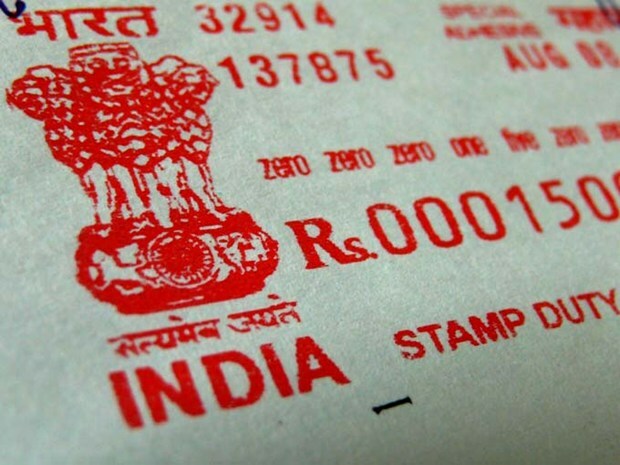 The issue with respect to payment of stamp duty vis-à-vis., the fair value fixed under S. 28A of the Kerala Stamp Act, 1959 was considered by this court in Ranga Swamy Chettiar A. v. Mari Chettiyar & Anr. MANU/KE/1540/2010 : (2010 (4) KLT 367 : 2010 (4) KHC 523), and held that, stamp duty has to be paid at the rate which exists at the time of execution of instrument involving immovable property. So also in All Kerala Document Writers & Scribes Association v. State of Kerala (MANU/KE/0181/2005 : 2005 (3) KLT 234), this court had occasion to consider the issue with respect to enhancement of stamp duty with respect to execution of the document and held that, a document shall be deemed to be executed for the purpose of the Act, at the time of signing it and the stamp duty payable on it, is the one that is prevailing at the time of signing the document. So also S. 54 of the Transfer of Property Act deals with sale of immovable property. There the sale is defined as transfer of ownership in exchange of price paid or promised or part-paid and promised, and in the case of tangible immovable property of a value of ` 100/- and upwards, or in the case of a reversion or other intangible thing, can be made only by a registered instrument. 7. That apart S. 23 of the Registration Act, 1908 deals with time of presentation of document before the registering authority which says that, subject to the provisions contained in Sections 24, 25 and 26, no document other than a will be accepted for registration unless presented for that purpose to the proper officer within four months from the date of its execution. Therefore, if a document is executed prior to the enhancement of the stamp duty, the consequence of paying enhanced stamp duty will not arise. So also the circumstances, law and facts dealt with under the aforesaid judgments and the facts and circumstances in this case, have no material difference so far as the essence of the issue is concerned vis-à-vis. the law involved. Taking note of the respective submissions made across the Bar and the proposition of law discussed above, it is unequivocal and clear, petitioner is liable to pay stamp duty prevailing at the time of execution of the sale deed, by the Presiding Officer of the court as per the decree granted. 1. This Writ Petition is filed by the petitioner seeking direction to respondents 1 to 3 to perm it execution of sale deed as per the decree in O.S. No. 463/2013 in favour of the petitioner at the rate of stamp duty prevailing as on 13.6.2016 viz., date of deposit of the stamp duty by the petitioner, and for other related reliefs. Material facts for the disposal of the Writ Petition are as follows; petitioner is the decree holder in O.S. No. 463/2013 on the files of the Principal Munsiff Court, Ernakulam. The suit is filed for specific performance of an agreement for sale executed between the petitioner and the 4th respondent. Suit was decreed on 28.2.2014. Even though petitioner demanded the 4th respondent to execute the sale deed as per the decree, same was not adhered to by the 4th respondent. Consequent to which, petitioner preferred I.A. No. 3768/2014 seeking to get the sale deed executed through the process of court. Accordingly as per the direction of the court, petitioner produced the draft sale deed and deposited the balance sale consideration. Draft sale deed was approved by the court on 29.3.2016 and directed the petitioner to deposit the requisite amount for purchase of stamp papers for execution of the sale deed by the court. An amount of ` 2,15,000/- was deposited on 13.6.2016, evident from Ext. P4 chalan. 2. Petitioner was awaiting treasury advice to the court in order to purchase the stamp papers and the case was adjourned for the said purpose. In the meanwhile new Finance Act was introduced enhancing the rate of stamp duty for execution of sale deed, by 2%. According to the petitioner, even though the amount is already deposited with the treasury, and treasury advice awaited for purchasing the stamp papers, was told that, the enhanced rates would be applicable for execution of the sale deed. Thereupon, petitioner approached the Munsiff Court with a petition praying that, there may be a direction to the concerned Sub Registrar to execute the sale deed at the rate prevalent on the date of deposit of the amount by the petitioner. However, there was no positive direction from the Munsiff Court in respect of the petition filed by the petitioner. It is in this background seeking appropriate reliefs petitioner has approached this court. 3. Heard learned counsel for petitioner, learned Senior Government Pleader and perused the documents on record and the pleadings put forth by the petitioner. 2(f) "executed" and "execution" used with reference to instruments, mean "signed" and "signature"." 5. Therefore, for the purpose of registration under the Registration Act, 1908, the document should be an executed one either by the owner of the property or by the executant. Here is a case where the petitioner has deposited the money before the court in order to execute Ext. P1 decree passed by the Munsiff Court, Ernakulam in a specific performance suit filed by the petitioner. Mere deposit of money for the purpose of purchase of stamp paper before the court, there is no execution taking place. Execution takes place when the stamp papers was received by the court from the treasury and the document is executed by the Presiding Officer of the court, which passed the decree. 6. The discussion made above would clearly reveal that, the document is not executed by the court concerned. In the meanwhile, Finance Act was introduced and the stamp duty was enhanced by 2%, which thus means petitioner is liable to pay the stamp duty as per the enhanced rate. The issue with respect to payment of stamp duty vis-à-vis., the fair value fixed under S. 28A of the Kerala Stamp Act, 1959 was considered by this court in Ranga Swamy Chettiar A. v. Mari Chettiyar & Anr. MANU/KE/1540/2010 : (2010 (4) KLT 367 : 2010 (4) KHC 523), and held that, stamp duty has to be paid at the rate which exists at the time of execution of instrument involving immovable property. So also in All Kerala Document Writers & Scribes Association v. State of Kerala (MANU/KE/0181/2005 : 2005 (3) KLT 234), this court had occasion to consider the issue with respect to enhancement of stamp duty with respect to execution of the document and held that, a document shall be deemed to be executed for the purpose of the Act, at the time of signing it and the stamp duty payable on it, is the one that is prevailing at the time of signing the document. So also S. 54 of the Transfer of Property Act deals with sale of immovable property. There the sale is defined as transfer of ownership in exchange of price paid or promised or part-paid and promised, and in the case of tangible immovable property of a value of ` 100/- and upwards, or in the case of a reversion or other intangible thing, can be made only by a registered instrument. Viewed in that circumstances, petitioner is not entitled to get any relieves sought for in the Writ Petition. Therefore, the Writ Petition fails, accordingly it is dismissed.